The shopping carts of the largest Brazilian retailer – Pão de Açúcar- are fitted with RFID-enabled interactive displays that can identify the products placed in those carts and recommend cooking recipes accordingly, reports Ooh-tv. After realising that Brazilians are a bit ‘’short of ideas’’ when it comes to the use of mayonnaise, the brand decided to launch the campaign to educate consumers in this respect when it mattered the most- while they were shopping. The digital signage system they put in place is also able to detect merchandise from the cart’s surroundings, like vegetables and meat, and display recipes with Hellman’s and those ingredients, offering the consumer a discovery experience and augmenting the sales for complementary products. Speaking of which, the brand reported a 68% increase in sales during the 1st month of the campaign, as the solution was used by 45,000 people who were offered thousands of recipe ideas from Hellmann’s. Ooh-tv notes that this isn’t the first digital initiative launched by the brand in-store. In 2012, Hellmann’s sought to inspire Brazilians by printing recipes on receipts at check-out points, based on the products they bought and the brand’s mayonnaise. 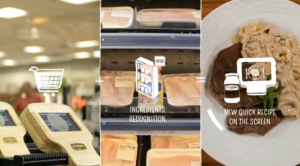 Here’s a video of Hellmann’s digital signage project explaining the problem they’ve tried to tackle, the solution they resorted to and the result they managed to achieve. If you want to learn more about the use of digital advertising screens in a retail environment, feel free to download our white paper or read our case-studies. 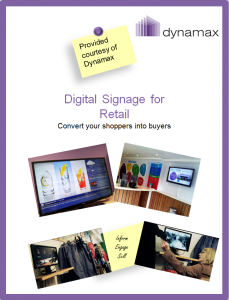 Dynamax Technologies are one of the longest standing digital signage companies worldwide. We provide enterprise and entry-level digital signage software solutions to organisations small and large, from large media owners to colleges and charities. Learn more about our company here. Get started with digital signage by signing up to digitalsignage.NET for free (browse this website to learn more about it). This entry was posted in Digital Signage, Hardware, News and tagged digital signage news, retail digital signage by Dynamax. Bookmark the permalink.